Green Party junior minister CiarÃ¡n Cuffe has got a rap on the hand from the Oireachtas just before all the TDs toddle off on their summer holidays. Mr Cuffe apologised for taking photographs in the DÃ¡il bar and posting them on his Twitter account last week. It showed how green Mr Cuffe really is that he claimed he rarely frequented the DÃ¡il bar and did not know that taking photographs was off limits. "I am not in the bar that often. I genuinely didn't know it was an offence," he said. The junior minister is currently drafting new laws to cut down on neighbourhood noises. The Noise Bill will be finished in the autumn, when it will be debated in the DÃ¡il. If passed, the Bill will empower GardaÃ­ to clamp down on late-night house parties, noisy house alarms, barking dogs and builders working at unsocial hours. 1. Ciaran cycled coast-to-coast across the United States. Rain, hail or snow CiarÃ¡n makes it to the DÃ¡il every day on his bicycle (pictured above). 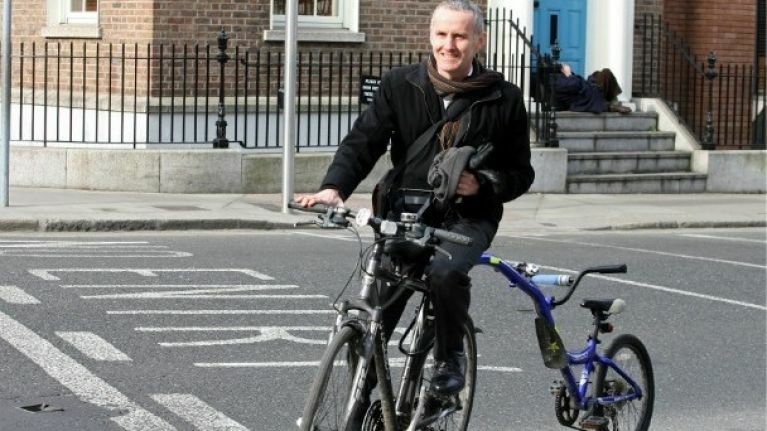 Heâ€™s an avid cyclist and is a member of the Dublin Cycling Campaign. Back in the day, CiarÃ¡n mounted his bike and completed a coast-to-coast cycle across the US. 2. CiarÃ¡n has a degree in architecture. He has degrees in architecture and town planning from University College Dublin, and lectured in urban planning at the Dublin Institute of Technology, Bolton Street, prior to his election to the DÃ¡il. A smart lad, so it seems. 3. CiarÃ¡n inherited $1.3 million. In June 2003, he stepped down as the Green party's environment spokesperson after it was revealed that he held shares worth â‚¬55,600 in a number of oil exploration companies, which he had inherited when his late mother had left him over â‚¬1m in her will. He was re-elected at the 2007 general election. The junior minister never fails to turn up at Punchestown for the annual Oxegen Festival. His attendance each year stretches back to the days when it was the Witness Festival. CiarÃ¡n can always be found in the mosh-pit and is a huge fan of Muse and Kasabian. 5. CiarÃ¡n is related to Bobby Kennedy. CiarÃ¡n's mother was Ethel Skakel Kennedy's sister. His cousins include the children of Skakel and Robert F. Kennedy. His granduncle was the Fianna FÃ¡il TD Patrick Little. *Fact 4 may or may not be made up. Fine, it is.